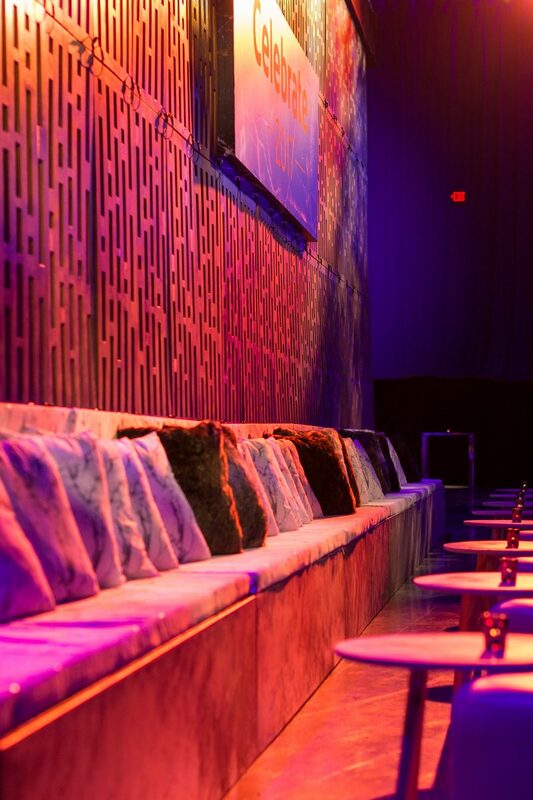 “The team at OneWest built, molded and perfected the concept using their razor sharp instincts, devotion to our brand and unparalleled care for the human experience." 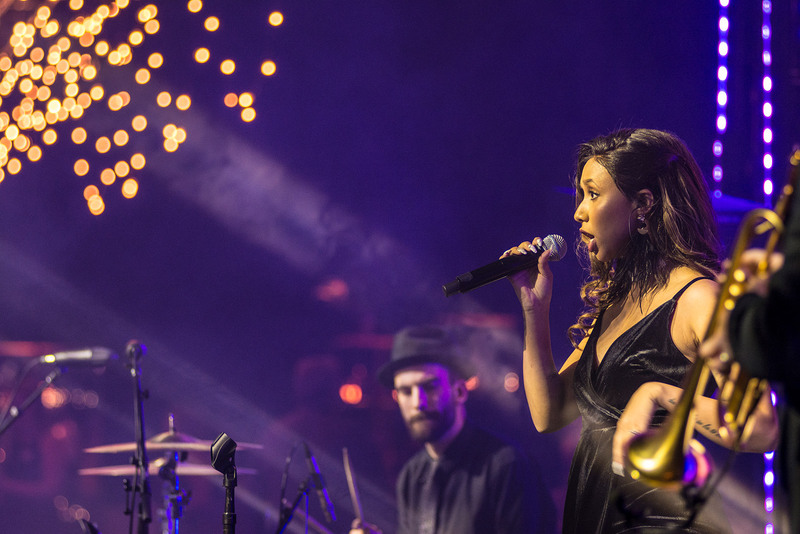 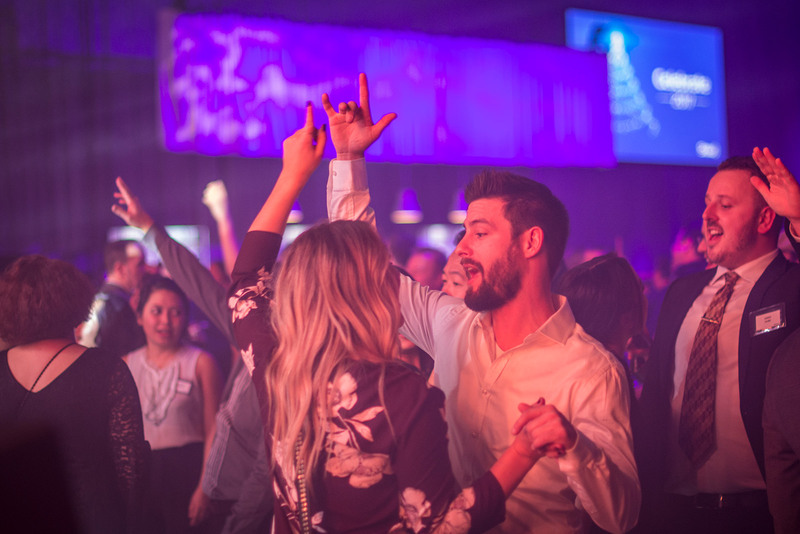 Celebrate, Shaw’s 2017 holiday party, was a unique after-dinner format intended to create a highly social experience and foster connections between employees and guests. 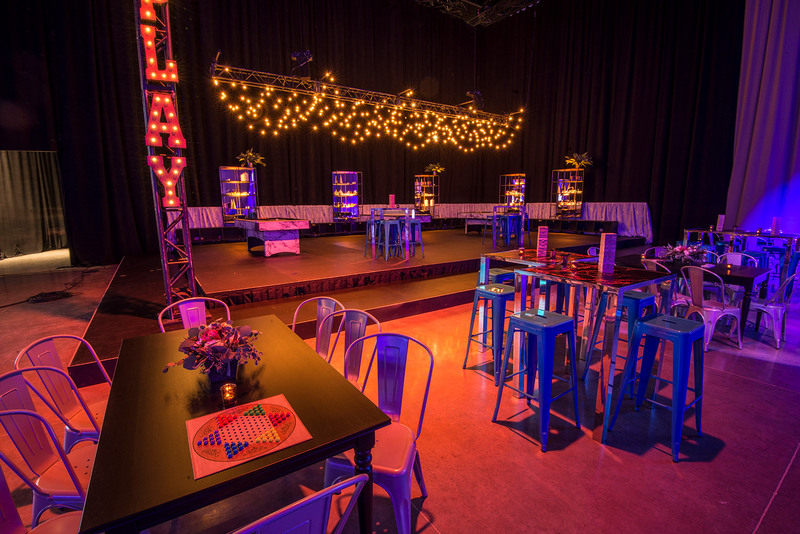 With no dinner tables to accommodate, our design centred around both bringing people together to socialize, and encouraging ongoing movement and mingling throughout the night. 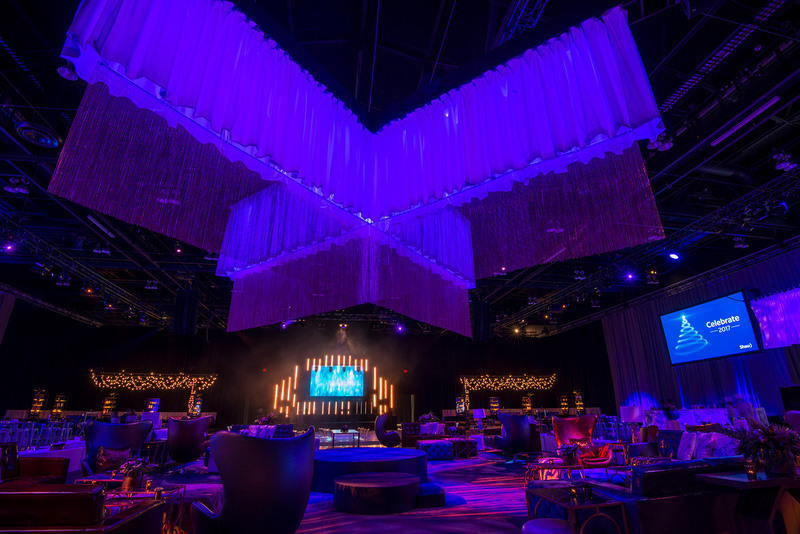 The concept for the design was “The Ultimate Hotel Lobby,” which worked to capture the experience of stepping into a beautiful hotel lobby – a space where visitors encounter so many different forms of interaction and entertainment – and every detail was designed with Shaw’s brand values in mind. 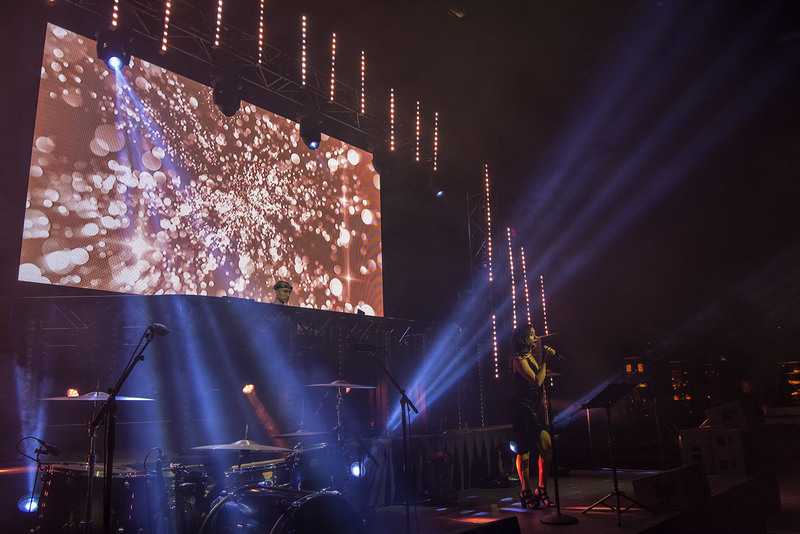 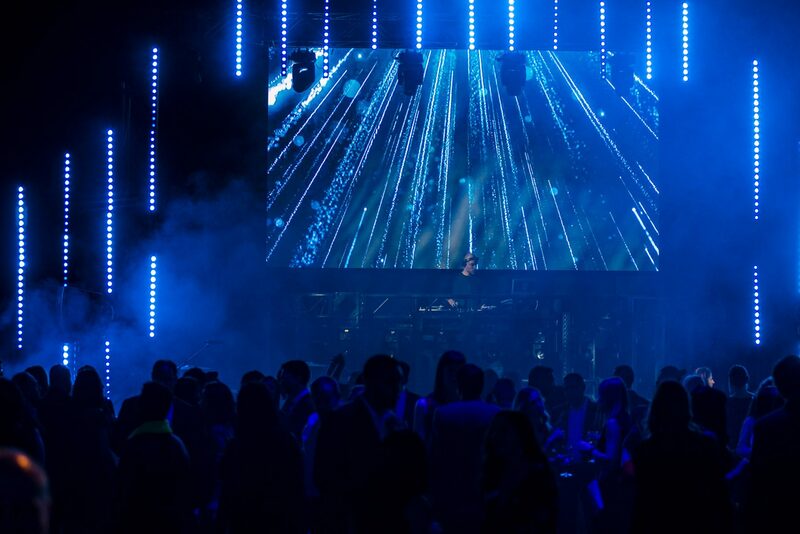 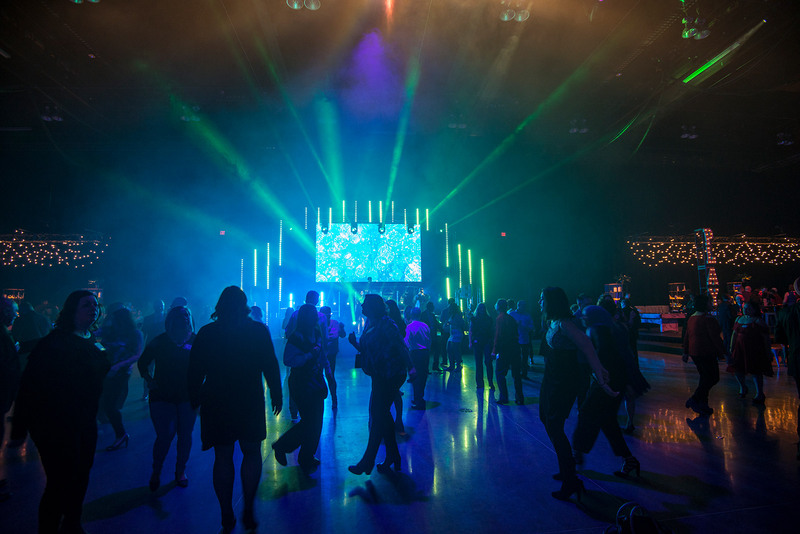 This event was staged in two locations, Calgary and Vancouver, on three separate nights, and we worked closely with our client and with vendors and partners in each city to create an equal guest experience at each venue, and a seamless client experience throughout the process. 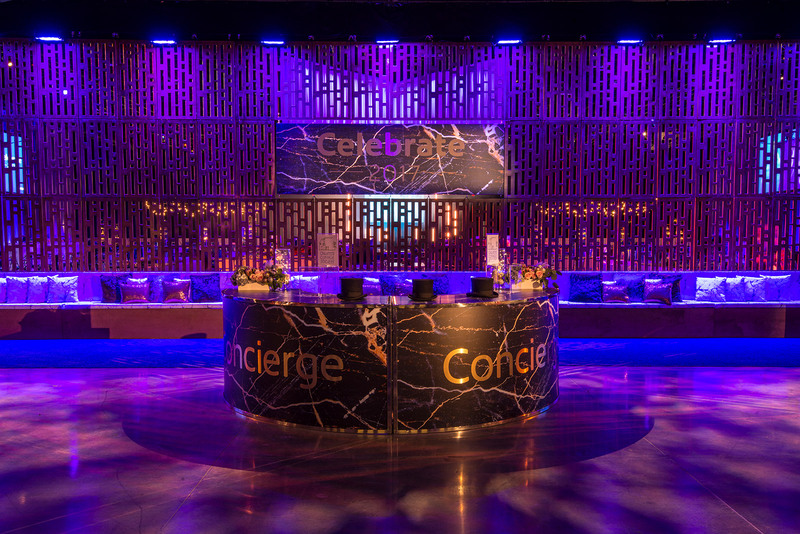 A concierge desk greeted guests as they entered the venue, just as it would in a grand lobby. 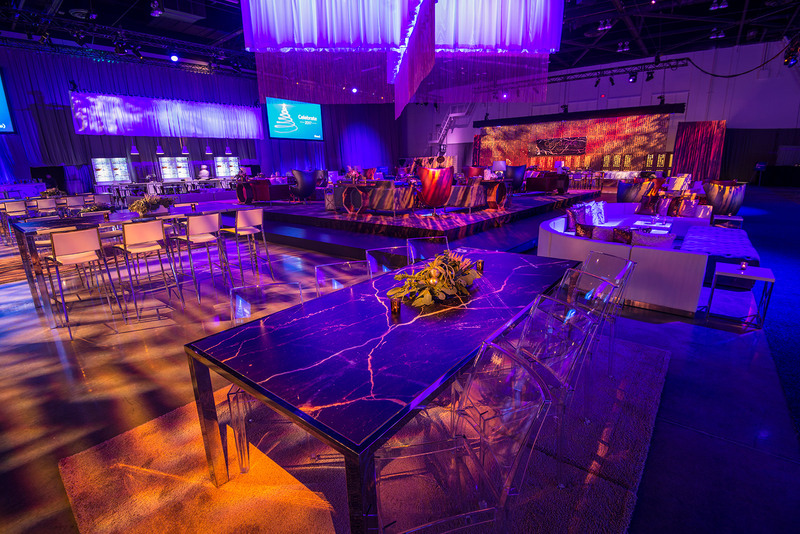 The desk was wrapped in navy marble with gold lettering, creating a dramatic entrance and setting the tone for a high-end experience. 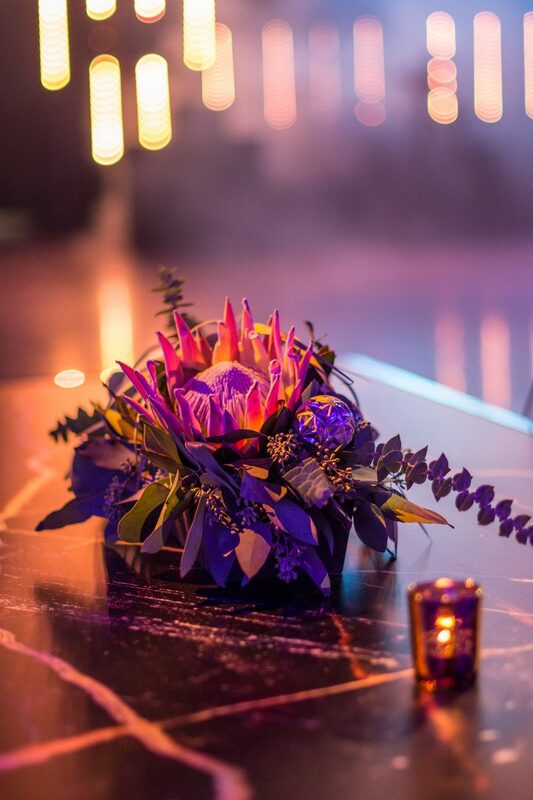 Nearby, custom navy marble pillars displayed Jeff Leatham-style florals – an iconic fixture in high-end hotels. 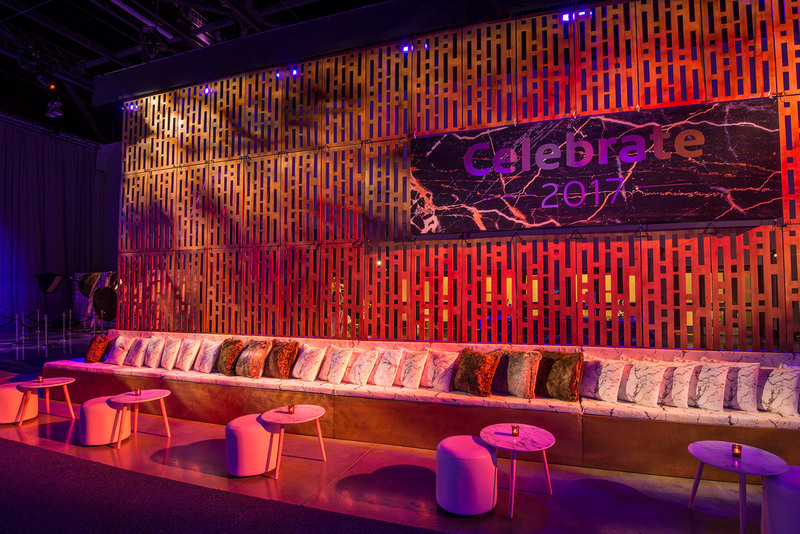 Behind the concierge desk, a custom-built white marble bench covered with luxe throw cushions ran along a custom-built feature wall that was suspended from the ceiling. 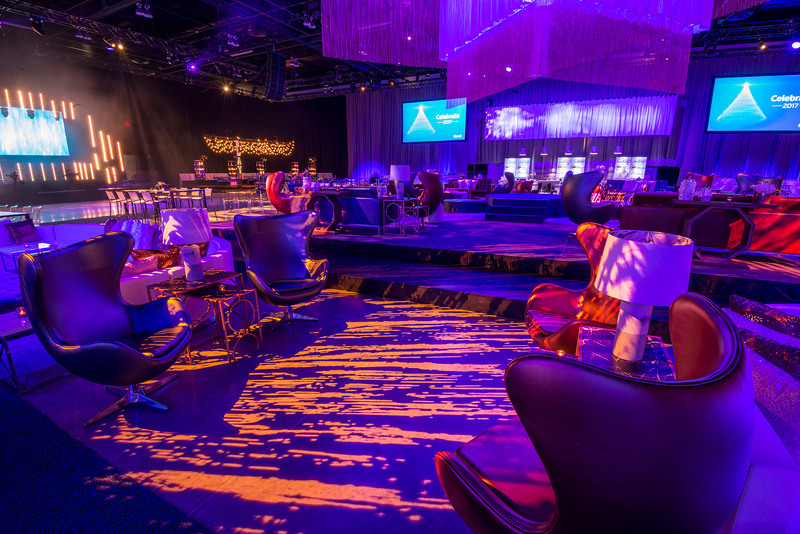 In the centre of the room, a raised “mega-lounge” created a hub for socializing, with rich seating arrangements in a cognac, navy, and marble palette, and provided a space for the circular stage area where live performances and speeches took place throughout the evening. 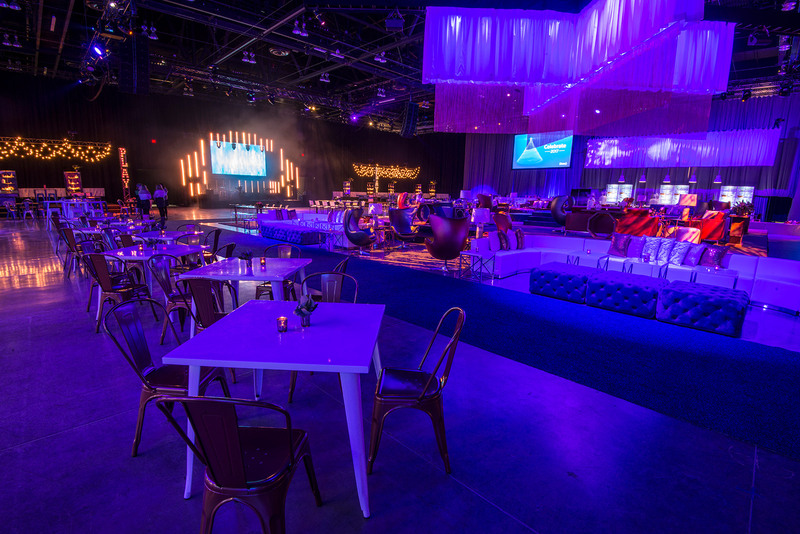 On ground level, additional lounges and seating areas ensured there were ample places for guests to take in performances, socialize, and enjoy the ambience. 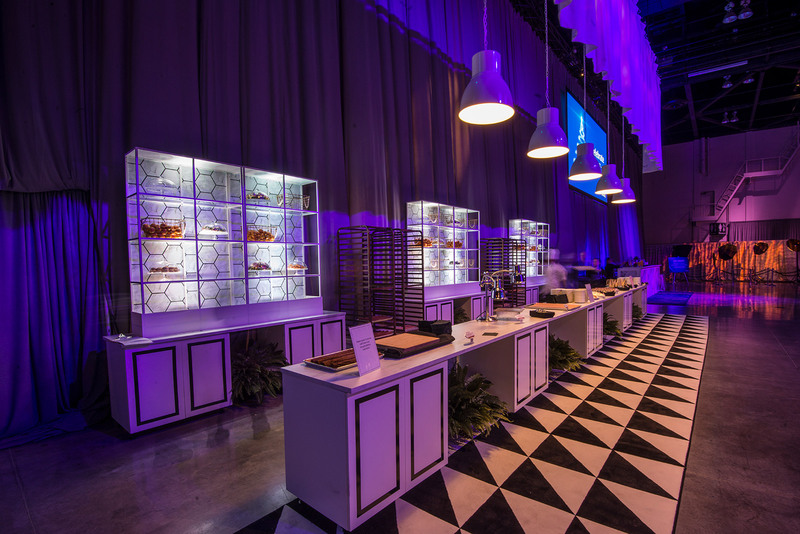 Two immersive bakeries were built on either side of the room, where guests “shopped” for treats while engaging directly with chefs. 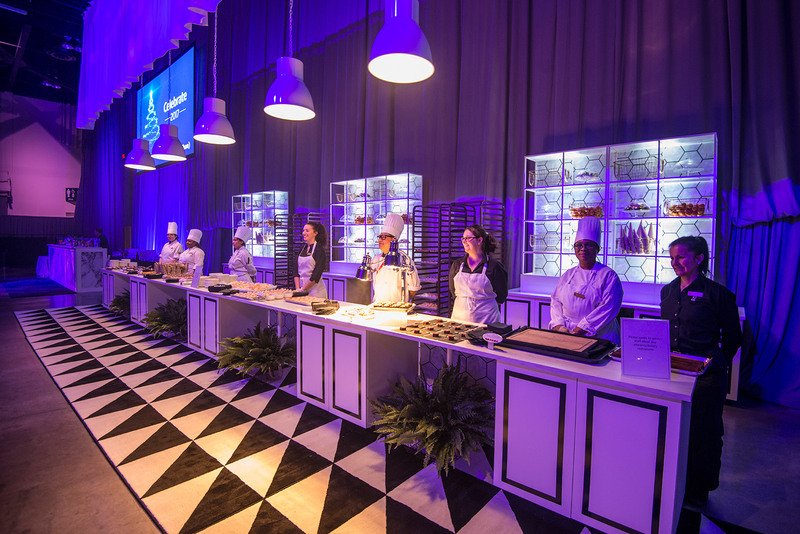 Raised, lit shelving and white pendant lights created a warm glow, drawing guests in to the bakeries, where accents like glass cake stands, beautiful florals, a luxurious rose gold bakers’ rack, lush ferns, and abstract black-and-white carpets made guests feel they’d stepped inside a spectacular high-end bakery. 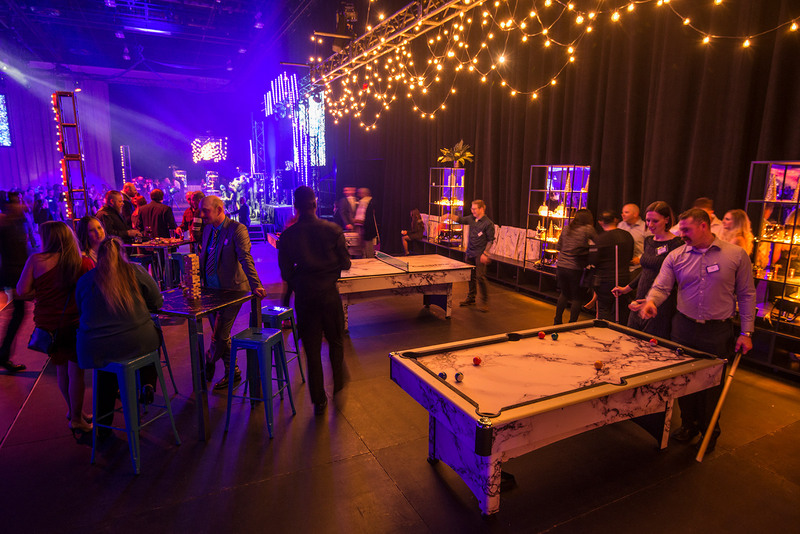 To really take socialization and interaction to the next level, we created two pub-inspired games areas on either side of the dance floor. 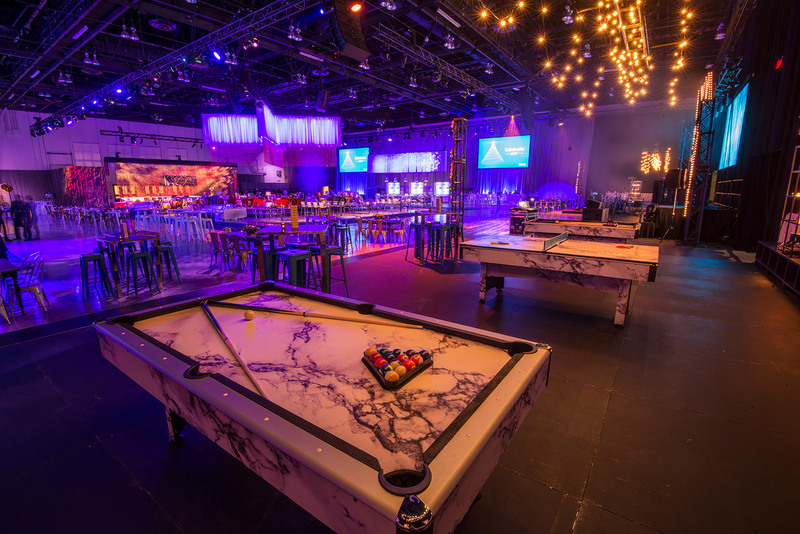 Square truss structures strung with café lights floated above risers which were filled with games: branded marble pool tables, ping pong tables, and table-top games like checkers, chess, dominos, Jenga, and dice. 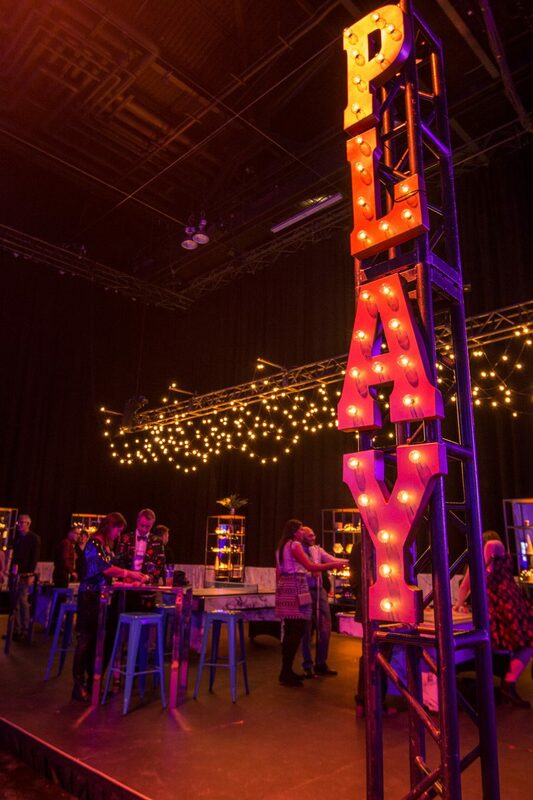 PLAY was spelled out in large marquee letters to catch the eye from across the room and bring curious guests to the games areas, where they were soon caught up in the fun. 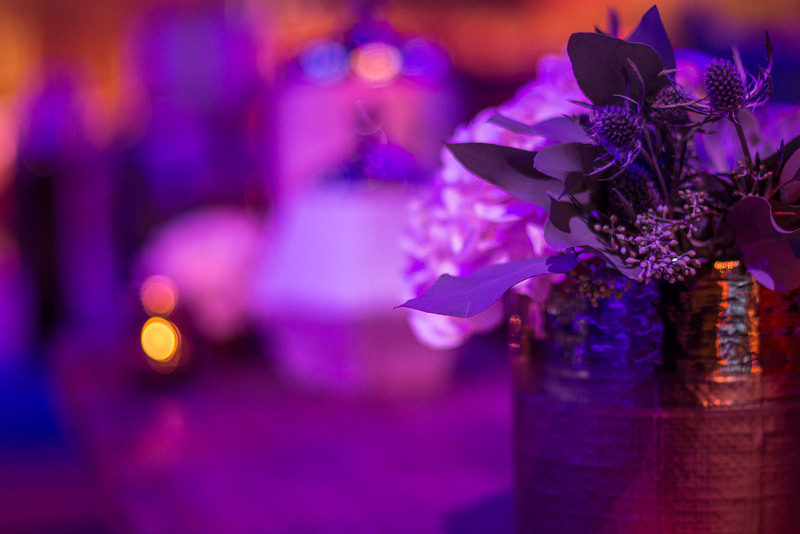 Every detail, from large to small, was incorporated into the event design and concept, and carefully considered to enhance the social experience for guests. 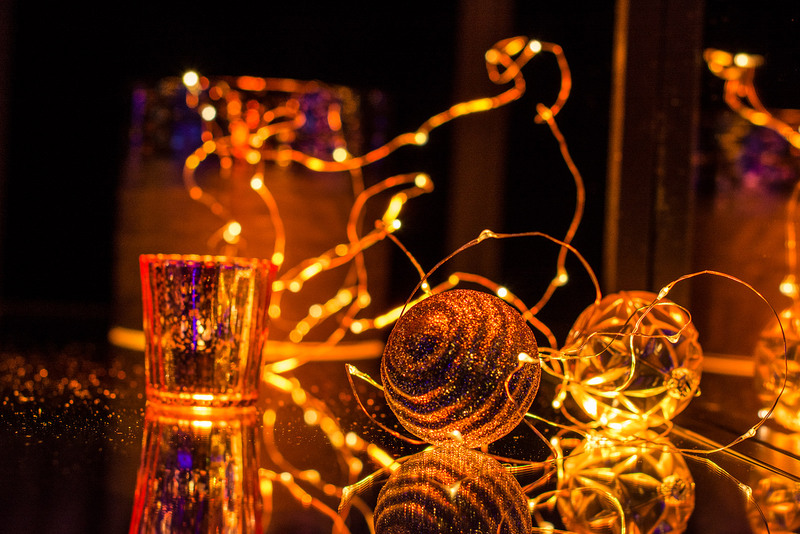 Subtle additions of rose gold ornaments throughout the space added a holiday touch, while blending with the design palette and ensuring the entire experience felt like a natural extension of the Shaw brand. 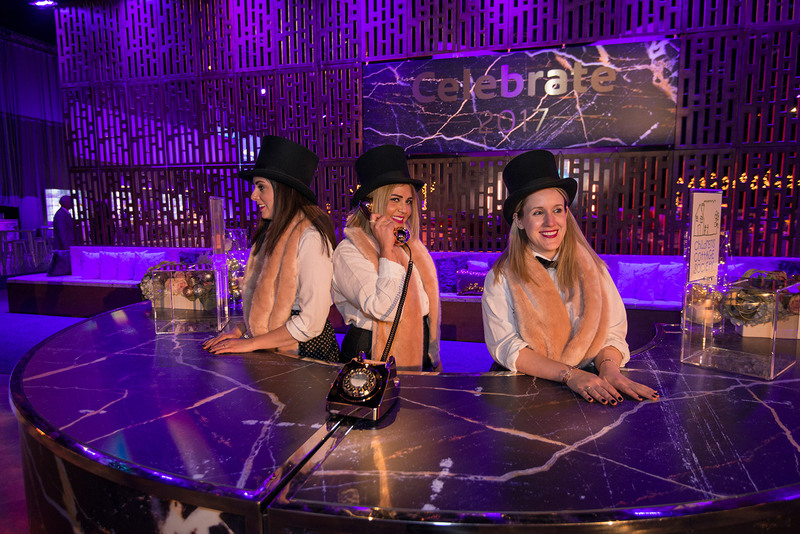 Guest feedback revealed the impression that we had created the hottest bar in town for one night only, and just for them. 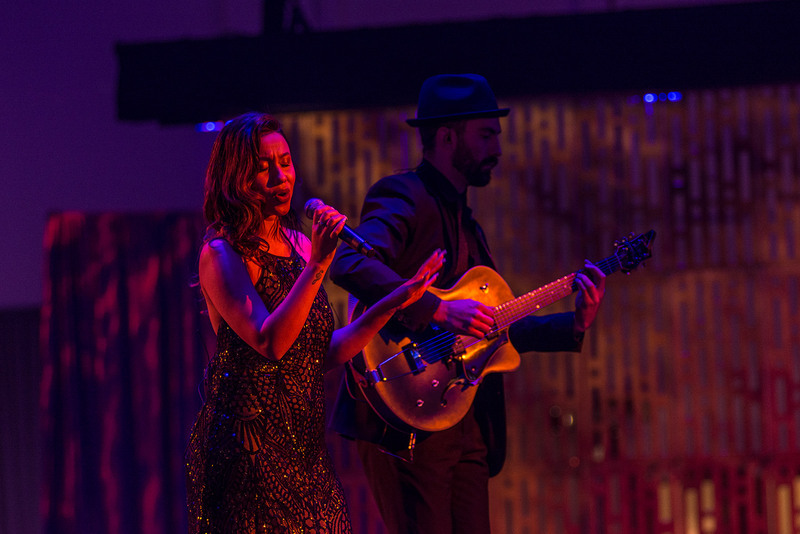 Attendees mingled, played, ‘shopped,’ and explored – just as one might do when landing in a new city, and stepping into the lobby of a grand hotel. 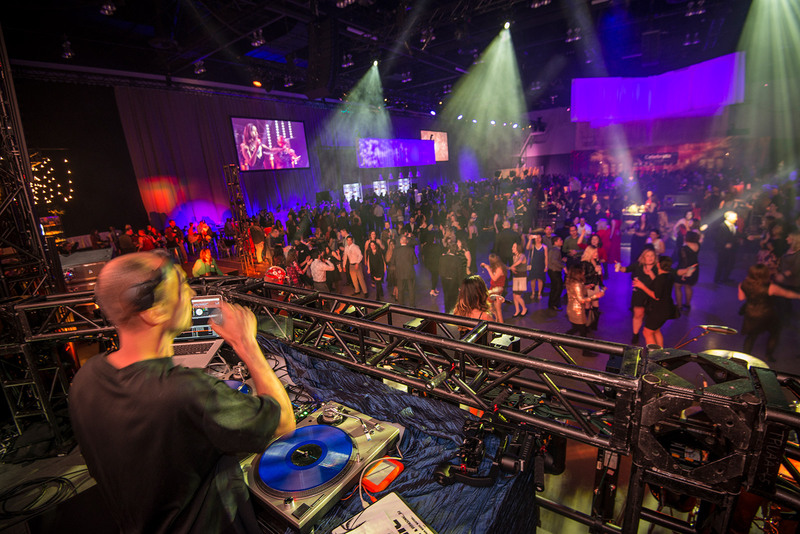 By staging the same event in two cities, we were able to provide an enhanced level of value to our client, engage vendors in each city, and ensure a consistent experience for our client’s employees in Vancouver and Calgary.